Split keyboards are everywhere these days. This guide will explain the many benefits of using a split keyboard and provide helpful tips on what to look for if you are considering making the switch. The primary reason split keyboards are so comfortable is because they reduce something ergonomists call ulnar deviation. Ulnar deviation occurs when the wrist is bent outward in the direction of the little finger which causes the carpal tunnel in the wrist to constrict. When the carpal tunnel constricts, it reduces blood flow, strains muscles, and puts pressure on the median nerve. Sounds painful, right? Try putting your hands on the home row of a conventional keyboard. See how your wrists are forced to bend outwards? A split keyboard addresses this painful posture in two ways: Separation and Splay. With a split keyboard, you can separate the two key modules and move them so the home row is closer to shoulder width. When the home row is at shoulder width, the natural typing posture doesn’t cause any ulnar deviation. 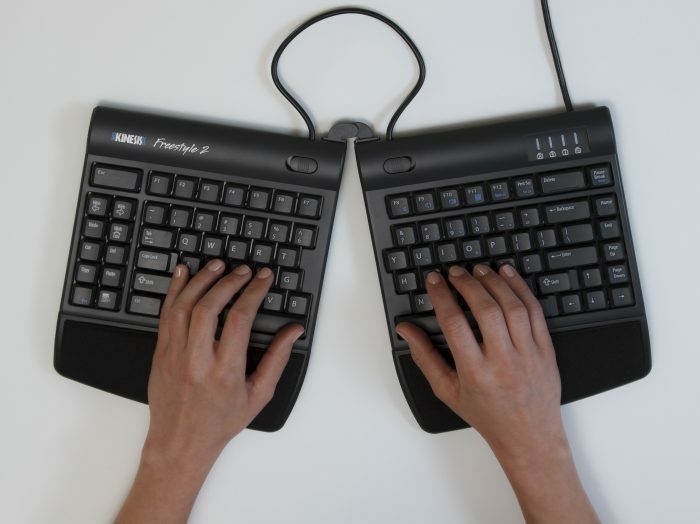 Split keyboards also address ulnar deviation by allowing you to “splay” (aka rotate) the two key modules, allowing the wrists to remain straight even though the elbows may be bent or rotated out. Another reason split keyboards are comfortable is that they can address what ergonomists call forearm pronation. A conventional keyboard is flat, so typing on it requires the palms to rotate face down to meet the keys, which pronates the forearm and wrists. Sustained forearm pronation increases pressure on the forearm muscles and surrounding tissues, reducing blood circulation which can lead to fatigue and injury. The only way to address forearm pronation is to elevate the thumb side of your hand when typing by “tenting” the two key modules in the middle. Research shows even a moderately tented keyboard can reduce the pain associated with forearm pronation. The optimal tenting angle will depend on your individual physiology, so make sure you choose a keyboard with adjustable, not fixed, tenting capabilities. The other “hidden” benefit of using a split keyboard is that it creates prime real estate on your desktop for a pointing device, a numeric keypad, a smartphone or tablet, documents, or even a snack. Some keyboards call themselves “split” but they don’t even allow for full separation of the key modules. 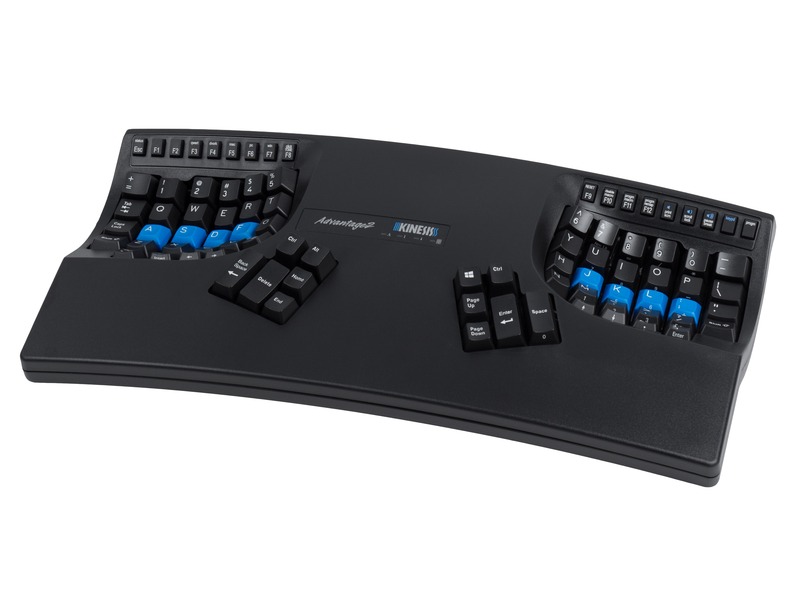 If you’re only planning to use a splayed configuration then those “faux-split” keyboards might be sufficient, but we recommend going with a model that has two separate key modules for maximum comfort and adjustability. When it comes to a truly split keyboard, there are two basic types to compare – Fixed Split and Adjustable Split. 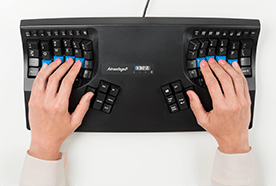 Fixed split keyboards are great because they utilize a one-piece design that simply separates the key groupings for the left and right hand to reduce ulnar deviation. The biggest downside is that fixed split keyboards are one-size-fits-all. 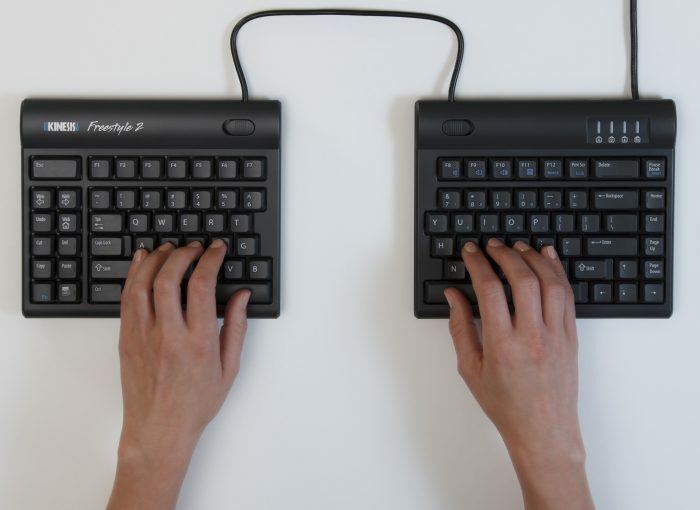 With an adjustable split keyboard, you can adjust the key modules to your specific body type (narrow shoulders or broad shoulders) and, just as important, vary the position of the key modules on a regular basis to keep your muscles fresh and healthy. 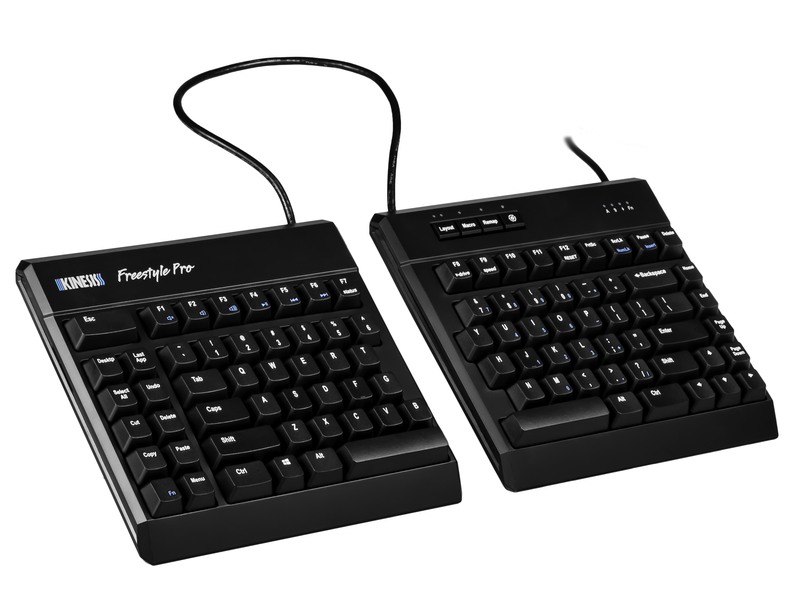 At Kinesis, we make two split-adjustable keyboard models – the Freestyle2 (FS2) and Freestyle Pro (FS Pro). The FS2 is our most popular and economical model with versions offering up to either 9″ or 20″ of separation. The FS Pro includes the same ergonomic feature set of the FS2 with additional features of mechanical key switches, onboard programmability and adjustable separation between 10 to 20 inches. 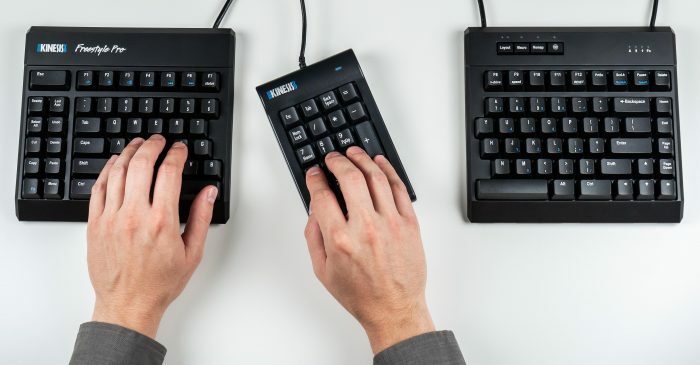 There is nothing wrong with a fixed split keyboard (we make a great one called the Advantage2) but you should make sure you have an extended period to try it out in your own home/office to make sure the split is right for your body (that’s why we offer a 60 Money Back Guarantee on all products purchased from the Kinesis store). There is nothing more frustrating about using a split keyboard than finding it won’t stay put. 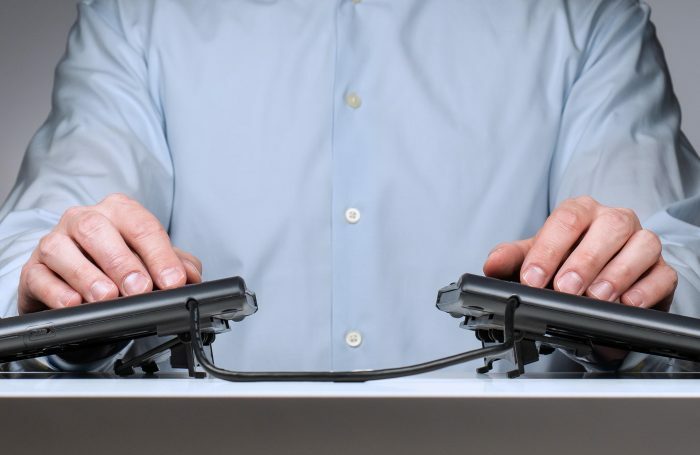 You figure out the perfect positioning to reduce ulnar deviation and forearm pronation and then, as soon as you start typing, the keyboard slips or collapses altogether! Different keyboards have different techniques for enabling split, splay, and tenting. And trust us, they are not all equal. When we first designed the Freestyle2 we spent a lot of time engineering all the features on our VIP3 and V3 lifter accessories to make sure the keyboard provides a stable, symmetrical platform for typing that is easily reproduced and doesn’t scoot, wobble, bounce, rock or collapse! Now you have some tools to evaluate split keyboards and decide which keyboard is best for your needs. But don’t forget, a split keyboard still has to do all the other basic keyboard stuff as well! Does it have palm supports to keep your wrists supported? We favor models with removable supports that make contact only with your palms rather than your more vulnerable wrists. How do the keys feel? Some ergonomic keyboards have surprisingly high-force keys and/or low-travel keys that cause finger fatigue when typing. If you’re interested in learning more about various types of key switches, read our Mechanical Keyboards Guide. Does the keyboard’s key layout make sense for your workflow? Many split keyboards utilize a modified QWERTY key layout and some secondary keys may not be located where you would expect. If you don’t see a layout that works for you, consider upgrading to a programmable split keyboard which will give you the freedom and flexibility to create your own key layout (see our Programmable Keyboard Guide). Does the keyboard have other productivity-boosting tools? For example, hotkeys for common shortcuts, operating system specific commands like those found on an Apple keyboard, or an embedded numeric keypad. What kind of connection do you need, wireless/Bluetooth or USB? What kind of warranty does the manufacturer offer? 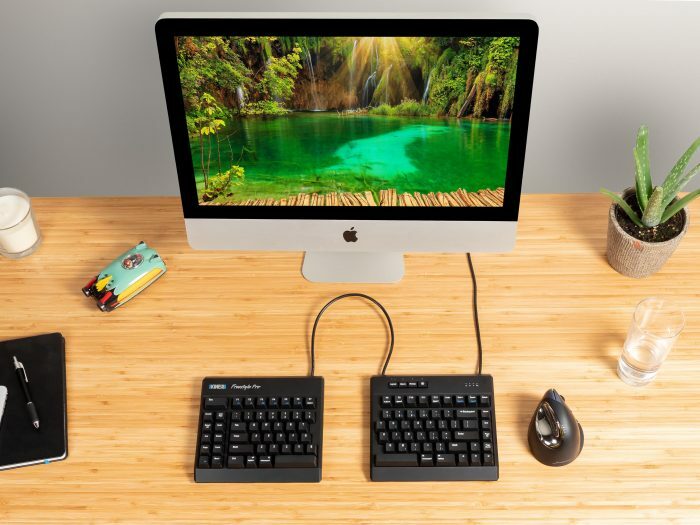 If you’re going to spend a little extra money to step up to a split keyboard, you want to know the manufacturer is standing behind their product. 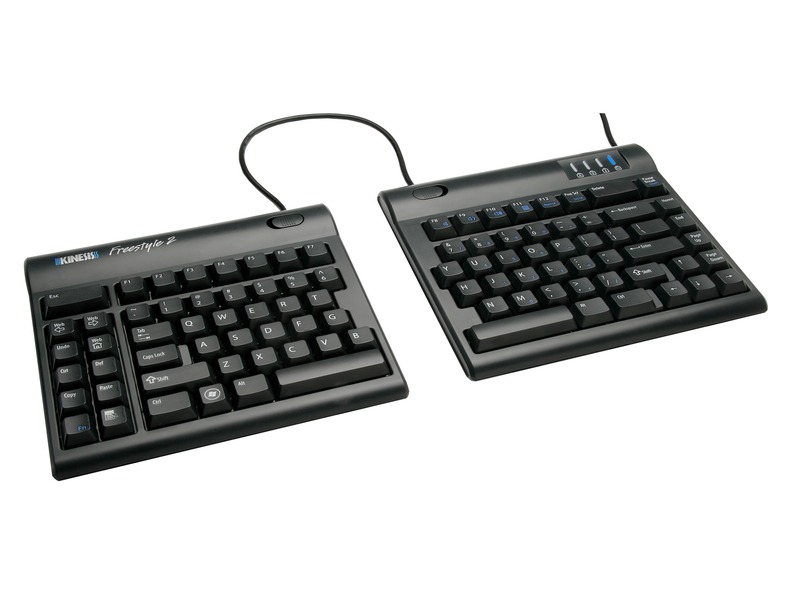 All Kinesis keyboards are backed by a 2 or 3 year warranty. What kind of return policy does the store offer? With ergonomic products, having an extended opportunity to evaluate the product is critical. That’s why we offer a 60 Money Back Guarantee on all products purchased from the Kinesis store. If you need help does the manufacturer offer free, lifetime US-based support?